For many years, I made the exact same turkey recipe for Thanksgiving. It is delicious, produces a tasty gravy, and is always juicy. However, in order to get that tasty bird and juicy gravy, it requires rubbing the outside of the bird with butter. For the past few years, since we discovered Sophie’s allergy to dairy, I’ve tried to substitute all kinds of things for the butter but have not had great results. The turkey is tasty as usual, but the gravy has been left a bit bland and sometimes bitter. Two qualities that are not good in gravy (or people). Last year, I decided to give brining a try and was so thrilled with the results. The bird was super, super juicy and full of flavor. In this recipe, I coat the bird with a bit of canola oil which helps to crisp up the skin. This does two things – it helps to hold in some moisture, and provides a coppertone-quality good lookin’ skin for those people who like a bit of that crispy goodness served with the bird. 1. Planning ahead. The bird needs to bathe in the brine for one to three days. After the bird has brined for as long as you can manage, rinse thoroughly inside and out, pat try, and proceed to roast. I like to roast the bird at a pretty high temperature for a short bit of time, then reduce it until the bird reaches 161 degrees F. It is super important to use a meat thermometer when roasting a turkey – there are so many variables that can change cooking time. By using the thermometer, you can guarantee that the turkey will be cooked properly without getting dry or overcooked. P.S. 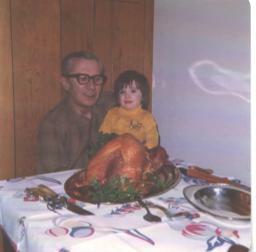 The turkey shown here was not brined, but was roasted by my Grandma and then carved up by my Grandpa. Look how cute he is, and I don’t mean the bird. In a large pot, combine 8 c. water, salt, sugar, spice blend, and bring to a boil. Boil and stir until all of the salt has dissolved. Combine remaining water (24 c.) and the brine liquid, stir and set aside to cool. Place turkey in a very large pot, then pour brining liquid into the pot. Cover with foil or lid and place in a cool place (34-38 degrees F) for 1-3 days. Remove turkey from brining liquid, rinse with fresh water, and pat with a paper towel to dry. Discard remaining brining liquid. Place turkey on a roasting pan and coat liberally with oil. Insert thermometer into the thickest part of the breast, then place roasting pan into the oven. Roast at 500° F for 30 minutes; reduce heat to 350° F and roast until thermometer reaches 161° F. Remove turkey and cover loosely with foil: let rest for at least 15 minutes before carving. – You can use a larger bird if you’d like, just adjust the brine recipe so that the turkey is fully covered in liquid. – I make this recipe ahead and then make a turkey stock out of the carcass and skin. I place the carved turkey into a crock pot and reheat slowly in the stock on Thanksgiving day. It saves me a ton of mess on a day when there’s plenty of mess and chaos in the kitchen, and is still very flavorful and juicy.